The Dutch War for Independence took place over much of Ter Borch’s early career. 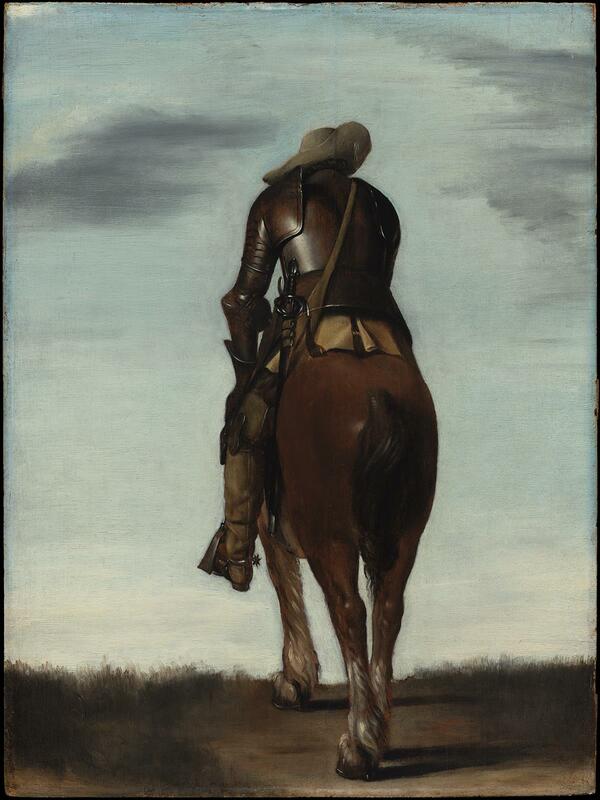 Seen from behind, this cavalier’s downcast head and slumped posture imply the weight, and perhaps even the loneliness, of war. One of three known versions of this painting by the artist, it’s among the earliest subjects he explored—he made a related drawing at just eight years old. Mrs. Mercer's heir and niece, Walpurga Baroness von Friesen, wrote to Angelica Rudenstine of the MFA (April 28, 1962) that she was certain her aunt had purchased the painting, though she did not know where. She recalled seeing it in the Mercers' home in Doylestown, noting that the last time she had visited was in 1936/1937. Helen H. Gemmill of the Bucks County Historical Society wrote to Scott Schaefer of the MFA (August 1, 1978) that "Freeman Auctioneers of Philadelphia listed 'Man on Horse' in their special sale of Mrs. Mercer's better things". Freeman did hold an auction of Mrs. Mercer's belongings (rare and valuable books) on September 23, 1960, and it may have passed onto the New York art market at that time. S. J. Gudlaugsson of the RKD wrote to Angelica Rudenstine (May 1, 1962) that a New York dealer had sent him a photograph of the picture in autumn, 1960, and that it later passed to De Boer.